Be the first to share your favorite memory, photo or story of Bessie. This memorial page is dedicated for family, friends and future generations to celebrate the life of their loved one. Age 97 passed away peacefully on October 23, 2018. A life long resident of the Owosso area, she was the daughter of James and Anna Salava. She married John Novak in 1945 and the two took up residence on Vandekarr Road where she resided for 68 years, her final year at the Welcome Home Assisted Living facility in Owosso. 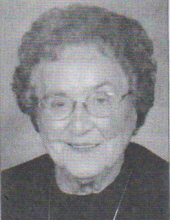 Prior to and during World War II she worked at the A.G. Redmond Company. Bessie was an integral part of the family-owned business, Novak Excavating. She was also a 25 year employee of JCPenney's. She was a member of Christ Episcopal Church of Owosso, serving several years on its altar guild and was a long-time member of the Owosso ZCBJ. She was predeceased by her husband John, in 2004, her three brothers James, Edward and Joseph Salava and sister Helen Frolka. Bessie is survived by her loving family; her two sons Dennis Novak of Owosso and Richard Novak of Bethesda, Maryland and their wives Mary Ann Novak and Ruth Lozner; three grandchildren, Allison Newell and husband Jeffrey of Owosso, Army Major Adam Novak of Southern Pines, North Carolina and wife Carissa Daniel Novak of Washington, DC and three great-grandchildren Harper, Axel and Metta Newell. She will be missed by all. Donations in her name can be made to the Christ Episcopal Church. A graveside service will be held at 10am on Friday, November 23, 2018 at Oak Hill Cemetery, followed immediately by a luncheon at Christ Episcopal Church. To send flowers or a remembrance gift to the family of Bessie M. Novak, please visit our Tribute Store. "Email Address" would like to share the life celebration of Bessie M. Novak. Click on the "link" to go to share a favorite memory or leave a condolence message for the family.